30 Pieces for Children, Op. 27 for Piano Solo. Dmitri Kabalevsky, Joseph Prostakoff (Editor). G. Schirmer, Inc. 1986. ISBN 0793536278 (paperback). Contents: At Night on the River, Caprice, The Chase, Clowning, Cradle Song, Dance, Ditty, Dramatic Episode, Etude, Etude, Fairy Tale, Little Fable, A Little Prank, Lyric Piece, March, Meadow Dance, Novelette, Old Dance, Playing Ball, Rondo, Sad Story, Scherzo, Snow Storm, Songs of the Cavalry, The Tale, Waltz Time, War Dance, Sonatina, and Toccatina, Op. 27. 24 Pieces for Children, Op. 39 for Piano Solo. Dmitri Kabalevsky. G. Schirmer, Inc. 1986. ISBN 0793535824 (paperback). Contents: Clowns, Folk Dance, Op. 39 #17, Galop, A Happy Outing, Op. 39 #24, Improvisation, Prelude, A Short Story, Op. 39 #22, Slow Waltz, and more. The Sonatinas for Piano. Dmitri Kabalevsky. G. Schirmer, Inc. 1998. ISBN 0793589274 (paperback). Two sonatinas (Op. 13, #1 and 2) for the intermediate student or amateur pianist. Easy Pieces for Piano. Dmitri Kabalevsky. G. Schirmer, Inc. 1999. ISBN 0793589304 (paperback). 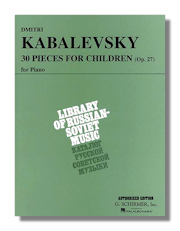 A collection of 59 pieces for the beginning pianist by a 20th-century Russian master. Includes 24 Easy Pieces for Children, Op. 39 and 35 Easy Pieces, Op. 89. Complete Sonatas for Piano: Sonata #1, Op. 6; Sonata #2, Op. 45; Sonata #3, Op. 46. Dmitri Kabalevsky. G. Schirmer, Inc. 1998. ISBN 0793589266 (paperback). Three sonatas (1927, 1945, 1946) from the popular Russian master. 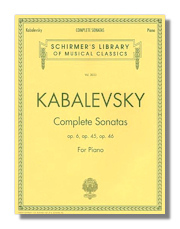 Complete Variations for Piano. Dmitri Kabalevsky. G. Schirmer, Inc. 1999. ISBN 0793589312 (paperback). 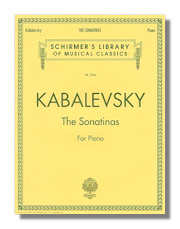 This piano collection from the Russian master includes: Easy Variations, Op. 40; Easy Variations on a Russian Folk Song, Op. 51; and Variations on Folk Themes, Op. 87. 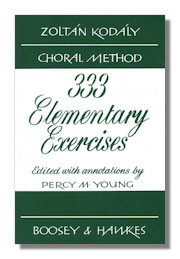 333 Elementary Exercises. Zoltán Kodály. Boosey & Hawkes. 2004. ISBN 1423438957 (paperback). The Kodály Choral Method is a comprehensive series of progressive songs and sight-singing exercises designed to promote a thorough understanding of interval and tonality. By incorporating a wide range of Hungarian folk music and poetry, Kodály has produced a stimulating addition to the repertoire of school and amateur choirs. This collection of 333 reading exercises is the revised English Edition, taken from the 1966 Hungarian Edition. 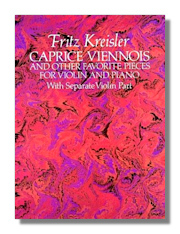 Caprice Viennois and other Favorite Pieces for Violin & Piano with Separate Violin Part. Fritz Kreisler. Dover Publications. 1995. ISBN 0486284891 (paperback). Newly compiled edition contains Liebesfreud, Liebesleid, Schön Rosmarin, Preludium & Allegro, Caprice Viennois, Rondo on a Theme of Beethoven, Sicilienne & Rigaudon, Tambourin Chinois and arrangements of Dvořák's Slavonic Dances #1 & 2. Reprinted from authoritative early editions.